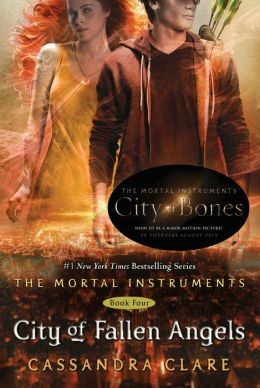 one of my favorite pats to finding a new series is to find myself totally enthralled in it, and after having my faith reinstilled after book 3, book 4, City of Fallen Angels keeps me so intrigued that i read right through it evenw hen i had a ton of other stuff to do. so at the end of book 3, we think that things are finally going to fall into place for Clary and Jace, yet of course that would be WAY Too easy. they are finally able to be tegoether which was a long time coming, everyone is beginning to get back to some sense of normalcy now that the mortal war is over and done with (or so they think), Simon finds himself in an interesting position where he’s ‘the man’ but his mother hates him. suffice it to say that Cassandra Clare keeps us really invested in all the characters. like what’s going on with Magnus and Alec, What’s going on with Izzy and Simon, and Simon and Maia, and how aer Luke and Jocelyn doing? it wouldn’t be another edition of The Mortal Instruments though if one of the most hated characters doesn’t some how come back, and if other GREATER demons didn’t show their faces. Camille, the high vampire in NY returns, but for what and at what price? ahh, so much to think about and so much that i don’t want to spoil. Let me just tell you, you’ll read right through this one and find yourself really thankful that City of Lost Souls is out so you can breeze right into book 5. the ending of book 4 makes you so on edge that you really feel like you can’t wait until you pick up the next one. This entry was posted in fantasy and tagged Cassandra Clare, city of fallen angels, city of lost souls, Jace and Clary, The Mortal Instruments by iscm13. Bookmark the permalink.